Prometeia Seal String Roll 5M / 16.5 Feet One of the most crucial element in the Prometeia cooling system, where quality workmanship is key. Heating element placed in the back plate of the motherboard to prevent condensation. Mach 2 EasyMod Kit for AMD's 940 / 754 CPU. Known as Athlon 64 / FX. Forms a hermetic capsule when assembled and eliminates EasyMod system ensures the Micro freezer fits a variety of motherboards. Mach 1 EasyMod Kit for AMD's 462 A CPU. Known as Athlon, XP, and MP. Forms a hermetic capsule when assembled and eliminates condensation and water built-up. The EasyMod system ensures the Micro freezer fits a variety of motherboards. Mach 2 EasyMod Kit for Intel's 478 pin CPU, known as P4. Forms a hermetic capsule when assembled and eliminates condensation and water built-up. The EasyMod system ensures the Micro freezer fits a variety of motherboards. Mach 2 EasyMod Kit for AMD's 462 A CPU. Known as Athlon, XP, and MP. Forms a hermetic capsule when assembled and eliminates condensation and water built-up. The EasyMod system ensures the Micro freezer fits a variety of motherboards. Mach 1 EasyMod Kit for Intel's 478 pin CPU, known as P4. Forms a hermetic capsule when assembled and eliminates condensation and water built-up. The EasyMod system ensures the Micro freezer fits a variety of motherboards. 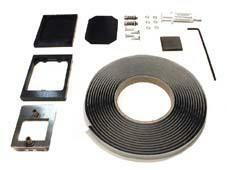 Mach 1 owners with this conversion kit can continue to use CPU EasyMod kits made for the Mach 2, Mach 2 ST and Mach 2 GT.